At least 8 characters: Should contain both letters and numbers. Yes, I would like to sign up for exclusive NOCO updates. Fantastic purchase!! Love this charger. I have used it on my car battery that was so low it would not even push start (Clutch). It would also not start using jumper cables. I figured lets try the charger. Hooked it up over night. I went out in the morning and it started right up!! I have also used it for my motorcycle battery. Awesome device!! I purchased the G 3500 battery charger to try it out on my AGM batteries that we're heading out the door because they were 6 years old and have been sitting for awhile. The voltage reading was 12.4 to 12.5 after being charged with a regular battery charger but would all the time drain down very fast when a small load was placed on them. I popped the caps and added distilled water to them then charged at the 12 volt cold AGM .9 amp setting which fully charged completely in around 2 minutes, then I performed the battery repair mode at 12 volts 1.5 amp current in which it took 4 hours to complete. I performed a battery diagnostic check previously in which the batteries failed and said to replace due to the resistance being very high... After the four-hour charge was complete I let the batteries sit for around 2 hours to settle down back to normal voltage range which was 12.8 volts. Then I performed another battery diagnostic test which showed the batties passing with high excellent percentage of all test and said good battery... The resistance started off at 18.2 then went down to 10.1 which was unbelievable that it could repair all the cells and make them new again. I love this charger, excellent job in creating this product... Truly genius!!! Best regards and keep up the great work in creating amazing products. I have the older and newer version of the charger. It is great to have around automotive shop for charging batteries efficiently I have no problems most of the time, when I do it is because the battery clamps are not making a good connection a wire brush helps fix this. Our lawn mowers stay charged using small battery mode. I want a bigger G15000 for motor homes but these are expensive. I just charge the two batteries seperatly instead. This is a pretty good 12V lead acid battery charger/maintainer. I bought it specifically for maintaining SLA (sealed lead acid) batteries used in UPS battery backups. I usually buy a bunch of them every few years to replace old/exploded ones for a dozen or so APC UPS's. The problem is they will sit around for up to a year before i need to actually do the replacements and that can kill some of them. So i finally bit the bullet and bought the NOCO G3500 to top them up and keep them alive until they're needed. Out of the box to using it was 5 minutes. It comes with a long battery and AC power cord plus the 2 DC cords that connect to the batteries. I used the oversized alligator clips, for the small 12V SLA's i have, they're huge but they worked fine! Realistically i can cut up the ring terminal cable and put on the proper fast-on connectors to fit my SLA's but the alligators worked fine. You just need to make sure you are properly connecting to the terminals. You may also need to clean the battery terminals, some can develop an oxide coating. I was able to top up the 5 SLA's i have in a few hours without any issues. Though the price is at the high end, this is a superb charger and i would recommend it. I received my NOCO G3500 charger in the mail. Opened the box, read the provided user guide. Hooked it up to my truck battery and starting charging. It was that easy. I look forward to my G3500 taking care of all my battery charging needs for many years to come. Una maravilla, lo tengo desde hace varios meses y es una pasada. Lo uso para todo tipo de baterias, he recuperado baterias que creia muertas. Carga incluso baterias que estan totalmente descargadas. 100% recomendado, la verdad que el mejor cargador que he usado en relación calidad precio, incluso tengo cargadores grandes el triple de caros y prefiero este mil veces. 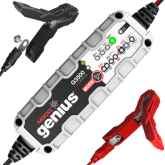 I originally purchased the NOCO Genius G3500 to keep my boat battery charged off season. Now I use the same charger for my new C7 Corvette, with a quick 10bucks 12V Plug connector (cigarette lighter plug), part number GC003. A better option than the "Battery Protection" option Chevrolet sells. Let me just say this is the best battery charger i've ever used. It's smart, lightweight, compact, and charges your batteries up like they are going out of style. Trying to decide between BatteryBuddy and Noco. Holy cow, the NOCO looks like it was designed by Apple. Gorgeous fit and finish, the wires are soft and pliable, not crummy hard wire like others. The battery Buddy looks like it is from 1950 and the Noco Genius is 2016. LEDS are good and very informative. I made the right choice. Will buy several more. THIS IS THE ONE YOU WANT. This charger is great it paid for its self took a tested as a junk battery charged it the batteries fine. It was on repair for 24 hours then charge took a day aswell. Not a quick charger but does it right and great battery tender. Great product!! use it to charge my Harley battery. Another Novo product for me! It works good. Used most of the functions. Not sure if the repair function does anything. Have set it and it does flash. Check it the next morning and it's back to standby. Who knows if it's doing anything. Have use for a dual battery diesel and single battery cars. Both charge overnight. This is just maybe sitting a couple days. Have even used it to push up 2 6 volt RV batteries. That took a few days. Have had less that 1 year. My Corvette sat in the garage over the winter and the battery was dead. Hooked this charger up to it and set it to a cold weather charge, and 12 hours later the battery was completely charged and the car started right up. The dashboard display showed a fully charged battery, and I have no hesitation in recommending this G3500 charger... especially to fellow 'Vette owners. Nice, versatile little unit. Seems well built and pretty good quality. 2 of 4 people found the following review helpful. Please Make A UK System For Singapore User Use. Singapore is using 230v input. Please do production of noco charger G3500UK, G7200UK. In singapore, motoworld motorcycleshop they don't carry that model and don't intend to bring in the g3500uk & g7200uk model. Friend of my, have one of it. It's perfect. Good design. Small size. Quick time of charge. But it work only in USA. I need it in Europe.